1335 Santos | Ocean View from Upper Deck! Across from Beach and Near Downtown Times Square! 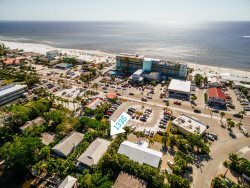 Just a short walk to the beach, most near beach properties are located either right across the street from the beautiful 7-mile stretch of sugar sand shoreline, canalfront with a dock, or oceanside where breathtaking sunsets can be witnessed almost every night! Condos located just steps from the sugar sand shoreline! Enjoy mesmerizing ocean views and sunsets every night! Private homes located just steps from the sugar sand shoreline! Some have a private pool, and some are on a canal, while all are equipped with a BBQ grilling area and outdoor deck!